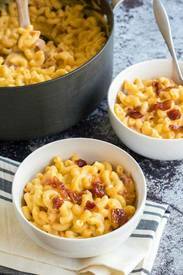 Whiskey bacon mac & cheese! Oooey & Gooey! Savory and sweet! You won't be able to only make this once! Our friends at Bread Booze & Bacon have set us up just right for this one!